The Church, which focused on harvesting Scheduled Castes and Most Backward Classes in the beginning, has also started concentrating on the upper echelons of the Hindu society. The days of boasting that “All are equal in the eyes of God” are over. Now they target each and every caste and convert them. The employees in media houses, workers in cinema and small-screen industries, and Hindus working in Christian institutions have become vulnerable to conversion attempts. Of late, special attention is being shown to the Brahmin community. ‘Sadhu Chellappaa’ is a notorious figure attired in saffron, started a dubious outfit called ‘Christian Brahmin Seva Samiti’. His modus operandi is distortion of Hindu scriptures to advance Christianity. He says he became a Christian as per the Order of Jesus and travelled throughout the state converting thousands of Hindus to Christianity. He became a full time evangelist in 1974 and founded the Agni Ministries. Since 1982, he has been running a Tamil monthly magazine, “Agni,” for Tamil people worldwide. Sadhu Chellappa’s ‘Agni Ministries’ (AM) are governed by “Evangelical Action Team of India” (EATI), founded by him in 1980 in Coimbatore. EATI concentrates on conversion activities in the guise of services in Education and Health. The main objective of EATI and AM is to Plant Churches and Harvest Souls, for which purpose they recruit Pastors and Evangelists and conduct training courses for them. Sadhu Chellappaa audaciously claims, “Diwali, the festival of lights, is a Christian Festival; Animal Sacrifice is a Christian culture adopted by Hindus and Gayatri Mantra actually glorifies Jesus. The Vedas, the ancient Indian sacred writings had anticipated the coming of Christ to take away the sins of man. They call Him Purusha Prajapati the creator God who would come as a man to offer himself as a sacrifice. Jesus Christ came to fulfill the Vedic quest of the Indian people, because the Vedas are incomplete without Him, just as the Old Testament was fulfilled at the coming of the Messiah”. Now we have a new breed of evangelists, who also have special expertise in inculturation techniques. Suseela Ragunathan is a Brahmin convert and she is an office-bearer in Christian Brahmin Seva Samithi. She identifies herself as ‘Suseela Maami Ragunathan’ and conducts evangelical congregations. Another evangelist by name Mani claims to have suffered a lot as a Brahmin Priest and had a turning point in life after converting to Christianity. He is a full time evangelist now identifying himself as Brother Mani Iyer. Christianising native festivals of non-Christian nations is a part of inculturation, which is the time tested modus operandi of the Church to increase their harvest of souls. The Roman Catholic Church has been focusing on Pongal for quite some time. The reason may be attributed to the fact that the festival falls in January within days immediately after Christmas and New Year celebrations. The Church effectively uses its control over Dravidian Parties to Christianise Hindu traditions. Diwali, the festival of lights, is a Christian Festival; Animal Sacrifice is a Christian culture adopted by Hindus and Gayatri Mantra actually glorifies Jesus. On the same year at the same time, the DMK government inaugurated a government sponsored festival by name “Sangamam” conceived by a Christian NGO by name Tamil Maiyam founded by Father Jagath Gasper Raj and Karunanidhi’s daughter Kanimozhi. This festival would start with Christmas and end with Pongal. The government roped in all the folk arts and folk music into the Sangamam festival notwithstanding the inclusion of Classical Music and Dance. Backed by the Church and funded by foreign sources, many Christian Organisations make well-planned short-duration documentaries after distorting Hindu scriptures to suit their convenience. While the evangelists masquerade as “Sadhus and Sanyasis”, and the organizations and ministries distort Hindu scriptures and produce documentaries, the Roman Catholic Church came out with a most outrageous ‘New Community Bible’ christened as the “Indian Bible,” which included sacred verses from the Ithihasas, Gita, Vedas and Upanishads. Religious conversion has been a subject of dispute for ages and the Church has been well-known for conversion activities to spread Christianity throughout the world in its pursuit of souls for harvesting.It mostly follows the strategies of allurement and pressure to convert the people following other religions. However, the most potent weapon in its armoury has been inculturation. The Church uses the process of inculturation with an aim to adopt the well-established Hindu cultural practices to confuse, corrupt and change the minds of the gullible masses. The Church has started setting up Hindu “type” of buildings and calling them as ‘Ashrams’ controlled by ‘Saffron robed’ Padres, projecting themselves as ‘Swamijis’. The Hindu style of architecture, construction, layout and interior designs are being followed. The buildings also have the Sanskrit ‘Ohm’ symbol in front of them and the saffronised Padres claim that Ohm is not Hindu, but Vedic! Some Churches also sculpture the statues of Jesus in ‘meditating’ posture, Jesus sitting cross-legged on a lotus with ‘Abaya Hastha Mudra’, Jesus emerging after a purification bath in Ganges and they even claim that yoga and meditation are not connected to Hinduism and that they are universal, common to all religions. 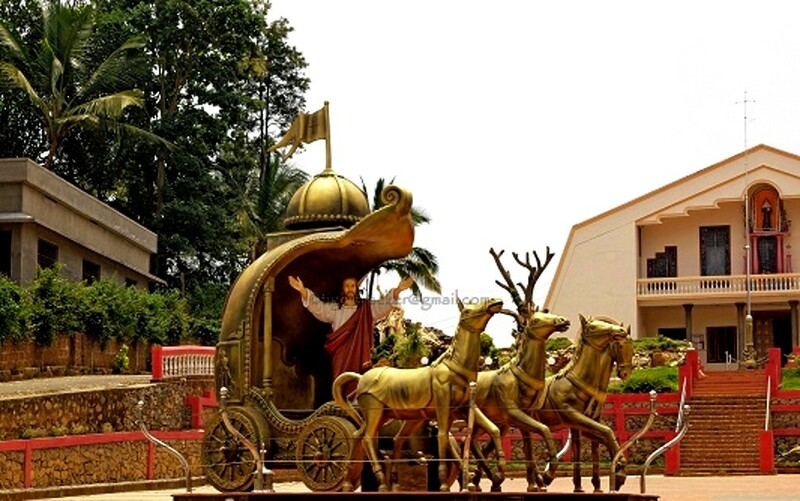 Jesus is placed on par with Bhagwan Krishna (we have seen our own “Corporate Gurus” making such claims) and the Church has even gone to the extent of showcasing Jesus riding a chariot like Krishna. The ‘Ashtothram’ and ‘Sahasra Naamam’ (108 and 1008 names) have also been prepared for performing ‘Archana’ on Jesus and ‘Aarti’ is also being performed. In Tamil Nadu, Churches have started ‘Padayatras’ for Velankanni, sometimes even with the ‘Irumudi’ (similar to the one taken for Sabari Mala Yatras). The Velankanni pilgrims have started wearing saffron robes. Many Churches have started giving ‘Chakra Pongal’ (Sweet Rice) as ‘Prashadams’ to people. Apart from Velankanni in Nagapattinam, the Velankanni shrine in Besant Nagar, Chennai also follows these practices of inculturation. Several Churches have started installing “Dwajasthambams” in the front yard, similar to Hindu Temples. The seemingly deliberate setting up of ‘Mary shrines’ in street corners, next to ‘Vinayaga’ enclosures / small temples, is a concerted effort to replace ‘Goddess Maariamman’ from the scheme of things as they exist now. Evangelists have been seen brazenly telling the village people that Mary (Mother) and Mari (Amman) are one and the same. During festival times one can find digital banners in the Santhome area of Chennai City near Marina Beach, claiming Mary as ‘Thiru Mayilai Annai’ (Mother of Mylapore), while the true ‘Thiru Mayilai Annai’ is Goddess Karpagambaal of Kapaaleeshwarar Temple. The Church has adopted every Hindu practice and the only thing left is the replacement of ‘Hindu Murthis’ with Jesus and Mary statues, which is most likely to happen anytime if this inculturation continues. Churches claim that this concept of inculturation has been aimed at bridging the divide between the Indian Cultural Experience and the Western Character of Christianity. Every Hindu symbol and every Hindu practice is being Christianised with an evil motive of de-Hinduising this society and the nation. This is creating havoc in the psyche of the Hindu majority provoking it beyond the limits of tolerance. Obviously the generic Church is scoring brownie points over the privilege of “propagation” given to the minorities in the Constitution. Nehru’s refusal to table the Niyogi Commission Report and the spinelessness of successive governments to enact laws banning conversions have resulted in huge territories of India getting Christianised rapidly. The North-east and Goa are lost totally; almost 50 per cent of Kerala is now Christian; Karnataka, Andhra and Tamil Nadu have become the focus areas of missionaries and rampant conversions are taking place even as we speak. The only remedy lies in bringing a Constitutional Amendment. At present, the Constitution ensures Freedom to practice and propagate religion and certainly doesn’t grant the right to convert others. Article-2’, which ensures freedom of religion, is subject to public order, morality and health. But, the process of inculturation being practiced by the Church now violates all of these, and calls for a total ban on such attempts and a legislation of a central anti-conversion Law. Also, the Constitution must be amended, so as to remove the word ‘propagate’, which is deviously used by the Church. The minorities must be allowed only to practice their religion and not to preach or propagate. To start with, the Centre must enact a blanket ban on inculturation with stringent punishments for violators. If at all the generic Church wants to sell Jesus in India, let them try to sell him with their own testaments. Let them not steal Hindu scriptures, symbols and rituals shamelessly.